Positioned in the chic yet cozy oceanside community in the SofA District in Downtown Delray Beach, 236 Fifth is in the heart of the SofA (South of Atlantic) district. Encompassing the two blocks to the south of Atlantic Avenue on Federal Highway between Second and Third Street, this unique area is a cultural hub of arts and entertainment, dotted with acclaimed fine dining establishments, quaint cafes, and bars. 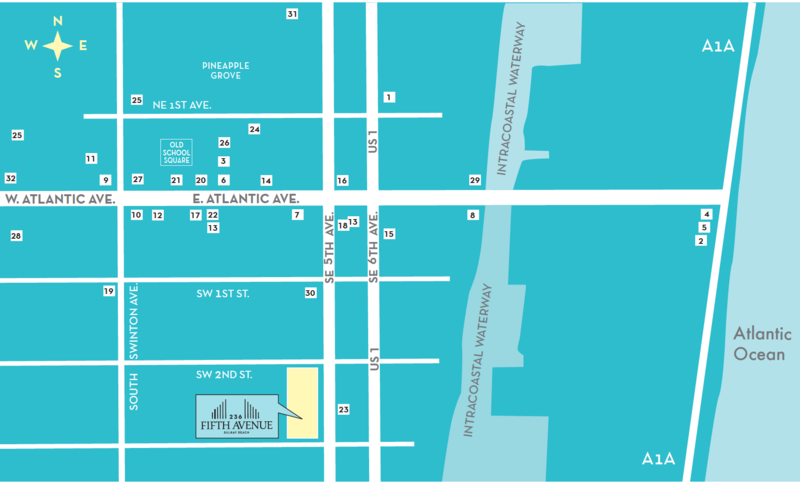 Only a few minutes’ walk is the world-class dining, shopping and culture of Atlantic Avenue, Pineapple Grove, the Intracoastal Waterway and the Atlantic Ocean. 236 Fifth is just 25 minutes from West Palm Beach, 30 minutes from Fort Lauderdale, and one hour from Miami and a mere 10 minutes away is tony Boca Raton. All dimensions, layouts, artist renderings, specifications, prices and features are approximations and subject to availability and to change without notice, as recommended by the architect, contractor and/or developer, and/or as required by lay. Stated dimensions are measured to the exterior boundaries of the exterior walls and corridor walls and to the center-line of interior demising and common walls, and in fact vary from the dimensions of the actual living space. Availability and prices of residences are subject change without notice. Oral representations cannot be relied upon as correctly stating the representations of developer. For correct representations, make reference to project documents provided by the developer to a buyer or lessee. All offers are subject to the terms and conditions of any sales or reservation agreement with the developer. Not an offer or solicitations where prior registration is required or otherwise prohibited by state statues. Equal housing opportunity.